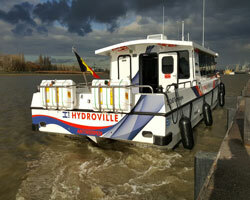 A new showcase for the use of clean fuel has been provided by a 14m hydrogen-powered passenger catamaran, introduced by Antwerp-based shipping group Compagnie Maritime Belge (CMB).Christened Hydroville, the vessel is claimed to be the world’s first accredited passenger vessel using dual-fuel internal combustion main engines designed to burn hydrogen and diesel oil. She was built in the UK by BW Seacat of Portsmouth. The goal of the project is to evaluate hydrogen technology for potential applications in large merchant ships, given CMB’s extensive fleet of bulk carriers, container vessels and chemical tankers. The environmental merit of hydrogen is that it produces no carbon dioxide (CO2), particulate matter (PM) nor sulphur oxide (SOx) emissions during combustion. Hydroville is serving as a commuter ferry in her initial phase of operation, transporting CMB staff along the River Scheldt between Kruibeke and the company’s Antwerp HQ at peak times. She will also function as a demonstration platform for hydrogen, and will act as an ambassador for hydrogen dual-fuel marine technology at various events in Europe. It is anticipated that Hydroville will also be deployed during the summer period for guest trips out of Ostend and Zeebrugge to offshore wind farms along the Belgian coast. The vessel is equipped with two Volvo Penta dual-fuel engines featuring 441kW in total shaft power capacity, driving two contra-rotating propellers. The H2ICED (hydrogen internal combustion engine-diesel) installation is served by 12 hydrogen fuel tanks, plus two diesel tanks supplying ignition and back-up fuel. The powering system grants the vessel a top speed of 27knots and a cruising speed of 22knots with a full complement of 16 passengers and two crew members. The seating arrangements allow for three different configurations, be it for commuter ferry or excursion duties, meetings or presentations. As the corporate goal is a ‘greener’ deep-sea fleet, the Belgian shipping group believes that it has to focus on combustion engines using biofuel or hydrogen rather than batteries or fuel cells, because of the perceived technical, operational and economic shortcomings of the latter for large vessel applications. Depending on how Hydroville fares in the field, the next step will be to fit a CMB container ship with a hydrogen-powered auxiliary engine. Hydroville will be bunkered from a hydrogen-filling marine station established by CMB and Air Liquide at Zwijndrecht, drawing on fuel produced locally at a plant in Lillo. Hydrogen is a gas that changes to liquid at a temperature of -252.8⁰C, and contains up to three times more energy per unit mass than diesel fuel. Its combustion produces only water, releasing neither CO2, SOx nor fine particles.